While we know Zika can lead to microcephaly and other birth defects if it affects a pregnant woman, we've been largely in the dark about the likelihood of infection among women who live in or travel to the areas where the virus is active. But according to a recent study, the risk may be lower than we thought. According to data from an LA-based clinic, only one out of 185 pregnant women who visited a Zika territory showed signs of the infection. 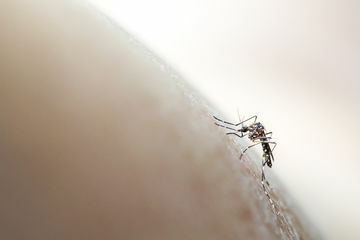 The study, which was published in Obstetrics and Gynecology, said that the woman who contracted the virus visited Honduras for 12 days during her first trimester: Though she didn't have symptoms, she did have mosquito bites and tested positive for the virus. Her baby and amniotic fluid tested negative, though, and the baby appears to be healthy at three months old. This news is reassuring, but it's too early to breathe a sigh of relief. The sample might indicate that Zika carries a lower risk than we thought, but it's entirely possible that other clinics would see a higher ratio of infected patients. What's more important to consider, though, is that even if the risk is lower than we realized, there is still a major risk associated with exposure to the virus. "Overall, for women who have had exposures to Zika virus, the risk of maternal infection is low," lead researcher Rashmi Rao, said, according to HealthDay. "But, the risk of Zika infection isn't zero, and I want to make that very clear. Our party line for women remains that we don't recommend they travel to these areas at all, particularly if they are considering pregnancy or are pregnant." While this may reassure women who have to travel to areas with local spread of the virus, or those who conceive unexpectedly after visiting a Zika area, we aren't changing our stance on one thing: If you're pregnant or thinking of getting pregnant, you should do everything in your power to avoid exposing yourself to Zika. Ultimately, it's just not worth the risk, however small that risk might be.